Have you always wondered what it would be like to create your own home design? Just imagine living in the home of your dreams. What would it look like? How many bedrooms would there be? Bathrooms? Would you like a large living room area, or something smaller that feels more cozy? Would you want a kitchen that’s large and open, or maybe you don’t cook a lot so a smaller kitchen would be just fine. Do you like high ceilings? Interesting architecture? What about a patio, or a deck outside for relaxing or entertaining purposes? As you can see, when you choose to build a custom home you have full control over what your house is going to look like, which is the main reason why so many people are looking to build custom homes nowadays. Building a custom home requires you to have a piece of land to build it on. This means that you’re going to need to find the perfect location for you to build your new custom home on, which are referred to as ‘lots’ in the real estate world. If you’ve already found a lot you’re interested in purchasing, great! That means you’ve already chosen where you want to live. If you haven’t found a lot yet, know that finding the perfect lot for you to build your home on can take some time, as there are many things you need to take into consideration, i.e. size of the lot, the yard (or absence of), neighborhood, school districts. Need to find a lot for your custom home? We can help you find the perfect lot for your dream house. You’re going to need a design plan for your new custom home. If you already have one made, you’ll need to show it to the custom home builder you’re interested in hiring in order to be sure everything is in order. They’ll go over your home design plans with you, letting you know whether or not any adjustments need to be made. If you don’t have any home plans made up yet, then all you have to do is share your ideas with the design team so that they can make a customized home plan for you. You could save a lot of heartburn later if you keep in mind a few things in the beginning. Your Specific Needs – if you want a small modern day loft and what the contractor has only built is huge traditional million dollar homes or vice versa. Testimonials/Reviews – are past clients/home owners satisfied with their work? If they were to build another home would they still choose the same builder. If not why? Our expert team of custom home builders will work side by side with you so that we can build the custom home of your dreams. We’ll be there with you from the very start, to the very end. We’ll guide you through the entire custom home building process, which is done to make sure that we’re both on the same page throughout the entire process. We believe that every single aspect of your new custom home deserves our undivided attention, and that’s exactly what you get when you choose RCH Custom Homes. 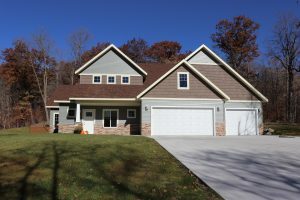 Looking for a custom home builders in the Detroit Lakes area in MN? Call us at 218-790-1468 today, we’re licensed and insured, and can help you build the home of your dreams!